I've been working on a cookbook for the past week or so. Don't get too excited; this is just a family cookbook. But I think it's going to be the start of another great tradition for us. Some of the recipes you've seen on this blog are in there; Shakshuka and the Cape Cod Chopped Salad to name a couple. Today's recipe is also in there. It features an ingredient that the Publix cashiers inevitably look upon in fear an dismay; they almost never know the code for Belgian Endive by heart. (Or, that the strange, tiny lettuce bunch looking things are even called Belgian Endive). Belgian endive (also known as chicory or French endive or witloof) is a small head of bitter leaves. The heads are kept completely covered as they grow, preventing the leaves from turning green. (Hint: the whiter the leaf, the less bitter the endive). It's a distant cousin of frisee, which I have a personal distaste for, unless it's covered in bacon vinaigrette. The benefit of a bitter leaf like Belgian endive is that it can stand up to the bite of a pungent cheese (like the gorgonzola dolce I use here). Paired with sweet and mild pears and toasted walnuts, it makes a perfect beginning to a classy dinner party. I first served this at the Friday Night Supper Club with the ladies, one of whom shot the wonderful photos you see in this post (thanks Jana!). 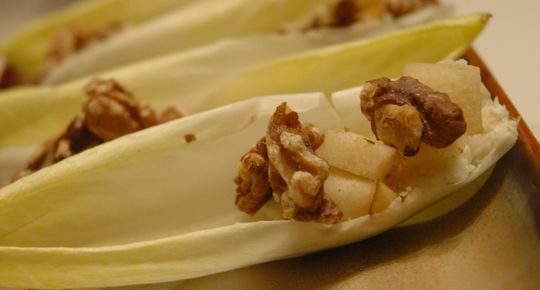 We just had to serve it again at our annual Thanksgiving dinner — and it was so well-received I think we'll be bringing it back whenever we can get our hands on some fresh Belgian endive. 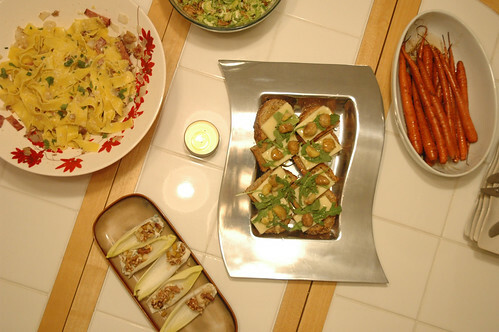 Adapted from Williams-Sonoma's Holiday Entertaining cookbook. Serves 8. Preheat the oven to 350° F. Place the walnuts in a single layer on a baking sheet and bake, stirring once or twice, until fragrant and lightly toasted, 10-12 minutes. Pour onto a plate and let cool, then chop coarsely. Separate the leaves of the endives. Choose about 40 of the pale ivory to light green inner leaves (reserve the others for another use). Halve and core the pears, then finely chop. Spread a teaspoonful of the cheese on the base of each endive leaf. Top with a little pear, and a few nuts. Serve at once.